I am pleased to welcome you on the occasion of your General Congregation and I greet you all with affection, starting with the General Superior, Fr. Vito Nardin, whom I thank for his words. Your visit shows the attachment to the Church and to the Holy See recommended and lived by your Founder, Blessed Antonio Rosmini. He lived heroically. He loved to repeat: "The Christian must nourish in himself a love, an attachment, and a respect without any limit for the Holy See of the Roman Pontiff" (Maxims of Christian perfection adapted to all kinds of persons, Lesson III, No. 6 ). Fidelity to the seat of Peter expresses unity in diversity and ecclesial communion, an indispensable element for a fruitful mission. During your assembly, you have proposed to reflect on the theme "Be perfect ... be merciful". It is a question of bringing to the fore the joyful news that every Christian is called to holiness, and to walk this path together in charity. This perspective, exquisitely evangelical, is a focal point of the teaching of your Founder, which can be found in a special way in the book of the Maxims. Sanctity and the exercise of virtues are not reserved for the few, or even for any particular moment of existence. Everyone can live them in daily fidelity to the Christian vocation; consecrated persons, in particular, in faithful adherence to religious profession. In this sense, Blessed Rosmini prayed: "O God, send us your heroes." It was evident in him what I emphasized in the recent Motu proprio Majorem hac dilectionem on the heroism of life, that is, "an offering of life for others, maintained until death" (No. 5). Holiness is the way of true reform of the Church, which, as Rosmini clearly saw, transforms the world to the extent to which it reforms itself. Your Founder has wanted to attribute to his religious family the denomination "Institute of charity", precisely to highlight the supremacy of the virtue of charity, which, as the Apostle says, must be placed "above all" (Col 3:14) ). And Rosmini accompanied charity with a strong "inner firmness", intrepid in the "silence": his example spurs you to progress in the fecundity of inner silence and in the heroism of external silence. This is the path that produces fruits of good and holiness, the path that the Saints have traveled and which the Church indicates to every believer. It is also important to maintain that "holy indifference" that your Founder drew from St. Ignatius of Loyola: without it it is not possible to implement an authentic universal charity. In your ecclesial activity, I invite you to arrange the works of corporal, intellectual, spiritual and pastoral charity in such a way as to always indulge the Holy Spirit who indicates where, when, and how to love. As far as educational action is concerned, it is not limited to simple instruction, but it is intellectual charity. In fact, the living center of Christian education is the science that is transmitted starting from the Word of God, whose fullness is Jesus Christ, the Word made flesh. Your apostolic presence has radiated in India, Tanzania and Kenya, as well as in the United States of America and Europe: I encourage you to be men with hands always stretched towards the suffering, to bring them the help of the faith and charity. I am thinking in particular of your confreres and the Rosminian Sisters who work in Venezuela, called to witness spiritual and material closeness to the hard-tried people. It is also good that your Institute should continue to reflect carefully on its own charism and, considering the fruits that have matured over the years, may increasingly open itself to the expectations of the Church and of the world. With the light of the Holy Spirit, you will find ways to continue with renewed enthusiasm, catching the signs of the times, the social urgencies and spiritual and material poverty of those who await words and gestures of salvation and hope. 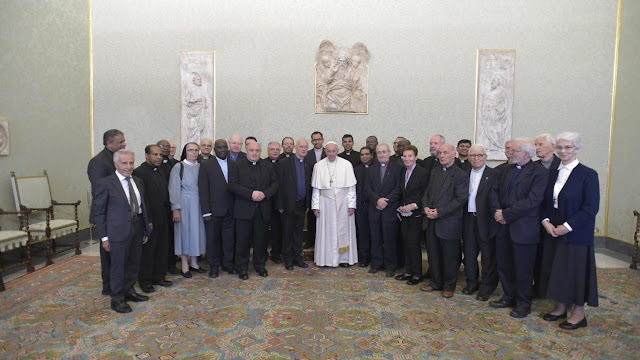 In this apostolic work you are joined by the "Ascritti", clerics and laymen who, living in the world, wish to attain evangelical perfection in communion with your Institute. It is good that they are made more and more involved in your community life. Dear brothers, your Institute, with the specificity of the Rosminian charism, can still offer a valid service in the proclamation of the Gospel. I urge you to propose with constancy and foresight the spiritual and doctrinal heritage that you have inherited. The inevitable difficulties do not discourage you, but they encourage you to trust always in God to continue with joy and hope the mission that He has entrusted to you. May the Holy Spirit make you living instruments of universal charity in the Church and in the world, capable of helping those you meet in your apostolate to incessantly renew hope, which "does not disappoint, because the love of God has been poured into our hearts through Holy Spirit who has been given to us "(Rom 5: 5). I entrust you to the maternal protection of the Virgin Mary and I cordially impart my Apostolic Blessing to you. Please do not forget to pray for me. Thank you.